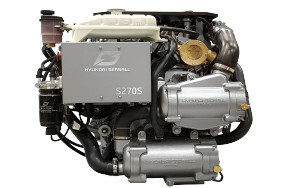 The 4 in-line 2.2 litre powerplant is a completely new engine, replacing the venerable D170 which had been in the line since the company's creation in 2010. The R200 gives 18% more power and delivers 22% more torque than its predecessor for better acceleration and quicker performance to get on plane. Acceleration is improved with the use of an electronically controlled variable geometry turbocharger as well as optimal mapping of the 2000 bar common-rail fuel injection system. The R200 features a strong cast iron cylinder block mated to a light-weight aluminum 16 valve cylinder head. Service-friendly features include a reusable air filter, color coded service points, water-in-fuel alarm, easily accessible seawater pump, one-button used oil drain system and easily replaced engine anodes. The R200 comes standard with Hyundai SeasAll's proprietary SeasLink system which provides both service and navigation functions to the boat's skipper via his smartphone.